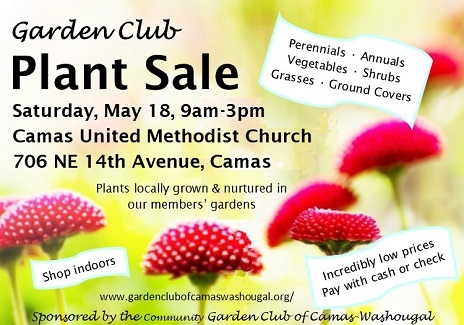 May 18, 2019, 9am-3pm, get top-quality plants at incredibly low prices at the Annual Plant Sale of the “Community Garden Club of Camas Washougal” (CGCCW). On May 18, head to the Camas United Methodist Church, 706 NE 14th Ave., Camas, WA. There’s plenty of parking in the church parking lot and adjacent streets. Shopping is indoors. Check or cash only. The plants—coming straight from some great private gardens in Clark County—are nurtured in quality potting soil, and cost a fraction of what you would pay retail. Plus, there will be a great raffle prize! If you have questions about how to care for your new plants, we will have expert gardeners on hand to help you. CGCCW is a non-profit 501c(4) organization and focuses Plant Sale proceeds towards promoting and supporting local gardening education projects and grants. We welcome new members. Learn more about us and what we do at www.gardenclubofcamaswashougal.org and www.facebook.com/CommunityGardenClubOfCamasWashougal/. Plant sale lists coming soon! (except December), meet 3rd Wednesday in November. Clark County Big List of PLANT SALES – Spring 2019! 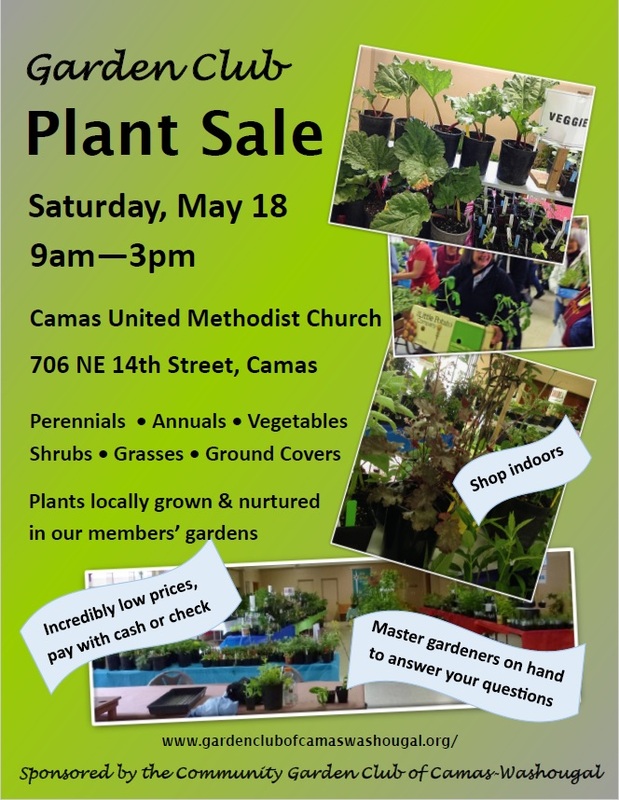 22nd Annual Camas Plant & Garden Fair – May 11th, Sat, 9am-4pm!